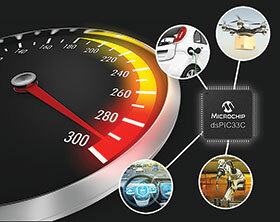 Microchip has released new dual- and single-core dsPIC33C digital signal controllers (DSCs) with more options to meet changing application requirements across memory, temperature and functional safety. The dual-core dsPIC33CH512MP508 enables support for applications with larger program memory requirements, while the single-core dsPIC33CK64MP105 adds a cost-optimised version for applications that require smaller memory and footprint. All devices in the dsPIC33C family include a fully featured set of functional safety hardware to ease ASIL-B and ASIL-C certifications in safety-critical applications.